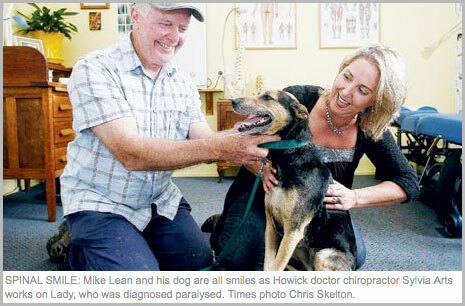 Mike and Tania Lean's cherished pet Lady was hit by a car last year and diagnosed "paralyzed" and worse by their vet. Cue Sylvia Arts, a doctor chiropractor, who when asked if she would treat the eight-year-old mongrel could not refuse. "At first I said I had never dealt with anything of this capacity. Mike said to me, 'a back is a back, a bone is bone, would you please check her?' If you can potentially help, how can you say no?" Mr and Mrs Lean travelled from their home at Kaiwaka, north of Wellsford, to visit Ms Arts in Howick, a trip they've been doing for some years as her regular clients. Giving it a go, Ms Arts says the first time she saw Lady, the little dog couldn't move her two hind legs and was in "terrible pain". "I'd been told she was paralyzed, but I knew she could feel what I was doing," she says. "Then her tail started wagging – we all nearly started crying. I was as astounded as Mike and Tania were." Lady's mum Mrs Lean told the Times the dog now runs around as if the accident never happened, the opposite to her diagnosis. Although Ms Arts enjoys working with Lady, it's an unusual case and she prefers to keep her practice for humans. "Obviously if someone came to me [with their animal] and had no other option I wouldn't say no," says Ms Arts. "People should always go to their vet first and there are professional veterinary chiropractors out there." Whether it's a human or canine, Ms Arts has used her same healing principals on Lady. Initially she treated Lady daily, then every three to four days and had her bounding around in two weeks. "Looking at Lady now, you'd never know what she went through last year," says Mrs Lean. "Seeing Sylvia really worked for us and it still works for Lady." Ms Arts does not want to take any credit for the dog's rehabilitation. She says she works on a principal of "getting the body to heal itself". "I clear the subluxations [when spinal joints misalign] to the vertebra, then the central nervous system, which is like the super highway of information from brain to body, can communicate better and then go on to heal itself." Lady still visits Ms Arts "every few months" for minor readjustments. Her owners say that "it's easy because Lady gets treated the same time as we do". "She still gets a bit nervous but mostly excited when she comes in," says Ms Arts. "It's as if she knows what I'm doing is good for her." Chiropractic is not only one of the most effective forms of care for a number of different health conditions, it's also extremely safe. Numerous studies have been conducted showing this to be true. Chiropractic's natural, non-invasive approach helps to minimize adverse effects and helps ensure a safe, successful outcome to care. In fact, according to a recent study published in the new issue of Spine, the leading international medical journal focusing on the spine and spinal region, "There is no robust data concerning the incidence or prevalence of adverse reactions after chiropractic." Chiropractic is and continues to be safe, natural and effective health care for all ages. Source: Spine. May 15, 2009. Volume 34. Issue 11. While we're not claiming chiropractic care will prevent bankruptcy, we do want consumers to be aware that chiropractic care has been shown to be a very cost-effective solution for back pain as well as other conditions. With more than 60 percent of U.S. bankruptcies stemming from excessive medical bills and the economy struggling to get back on track, now more than ever is the time to make not only wise financial decisions but also wise health care decisions. If you're suffering from back pain, musculoskeletal pain and other ailments, or you just wish to become healthier and "well" again, consider the safe, natural, cost-effective approach of chiropractic care. Source: The American Journal of Medicine. Volume 122. No. 6. New research indicates adults who get inadequate amounts of sleep experience an increased incidence of high blood pressure. In middle-aged adults, missing on average of just one hour of sleep per night over five years raises the risk of developing high blood pressure by 37 percent. This is concerning as high blood pressure significantly increases the risk for heart disease and stroke, and is the first and third leading cause of death in Americans. Other complications include heart failure, kidney disease and blindness. So if you're looking for a valid excuse to get your beauty sleep, you've now got it! Source: Reuters. June 8, 2009.